New trekking routes opened in West Bengal before 2014 Durga puja. Bhulabheda to Kankarajhara from Belapahari total distance is 15 kilometres. The trail is of the famous "Tenida" movie shooting location. The unimaginable beauty, Red rocky path, forest of salamahuyara, magnificent mountains, we love the environment, which attracts all the people. After the mine blast of 2008 this area of West Midnapore belapahari had been virtually cut off. 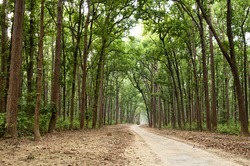 Now the forest department again is going to be equipped for Belpahari connecting road and trying to connect with the public. To convey the news to the people I started writing.